Formula books, I have called them; I don’t read them. Sometimes I buy them, if I think the cause is worthy, and I skim through, or even give them to other people, but I do not sit down and read, like I would with a serious book, written well to illustrate factually and emotionally accurate truths. Formula books may not lie, but they do not tell you the whole circle of truth, and of course that’s one reason they are so popular. Just like the rest of the corposystem, they tell you something that you want to hear, and try not to think about the parts you would rather believe don’t exist. For example there are formula books about organic farming that pretend we could save ourselves, very simply, if everyone would turn his or her hand to a backyard organic garden. Very simply, that is not true. And even though I believe strongly in organic gardening, and I do wish everyone would turn his or her hand and pocket book and political will to promoting organic gardening – I also think we need to hear the whole sorry truth about our human tragedy and our current biological dilemma. Otherwise, how can we deal with it? The solutions are not simple, and even though the modern formula book may be meticulously honest and accurate, it cannot tell the true story if it is so closely focused on setting down facts in simple, precise, decisive, linear outline, in words of few syllables, that it fails to discuss background, repercussions, and long-term implications from the point of view both of human realities, comparative emotional perspectives, and of unchangeable facts. If I could do that – I can see it, but I can’t say it — but I don’t need to do it for this case study, nor could I do it as well as it has been done by William deBuys. Recently I told you of a book that I have read cover to cover (or at least I will have by the time you read this. If all goes well.). 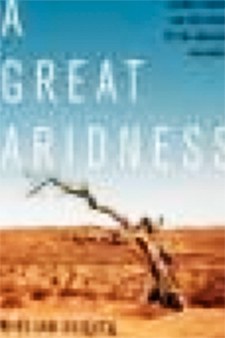 A Great Aridness, by William deBuys. Wm deBuys is an author and historian who addresses the reality of climate change without rancor, bias or hyperbole, as though it were just what it is, a complex story of human kind. A sad story of human compassion and frailty as well as heroism, dedication and responsibility. A story that has much to teach us. I heard his excellent talk at Upaya, and I thought: “This guy really gets it.” I mean both the human and the biological dilemmas. And so, a few days later – I’m telling you a true story here — Bitsy and I really did climb into our old pickup to chug to the top of one of the highest occupied places in North America, and I really did take the above picture along the way, to interview Wm duBuys. 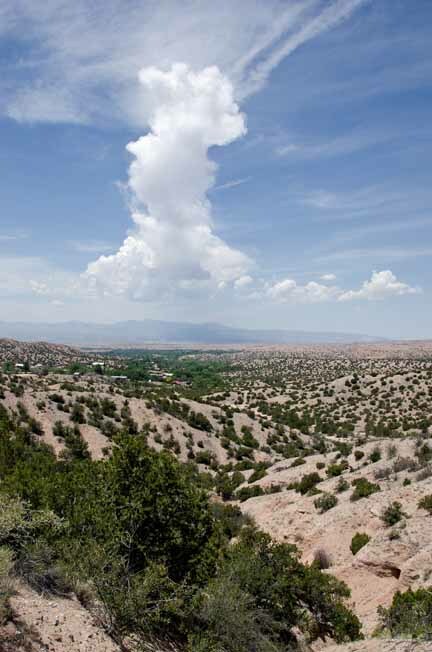 “(LL) The research in your book shows that there’s evidence of the impact of humans on the ecosystem for thousands of years in the southwestern United States and northern Mexico. People have been influencing the climate for as long as we know about. So now we have a big deal about climate change. My question is, what’s the big deal? “(WD) Well the big deal is that civilization has only known one climate, and that’s the climate that we’re losing now. The amount of temperature change predicted for this century is roughly equal to the temperature changes between the ice ages and the present. But when the transition from the ice ages took thousands of years to accomplish, we’re now embarking into a century that’s going to see the same amount of change in a tiny period of time. Basically, human civilization has only known the climate of the Holocene, the climate that has nourished earth for the past several thousand years. We’re on the verge of losing that bracket of conditions, and plunging into a new epoch which many geologists have termed the anthropocene because it is man shaped. So that’s a very, very scary prospect, if you value our way of life today, if you value the dependence of human society on existing agriculture and the systems that keep us going. “(LL) Why is it scary? “(WD) Well if you rachet up the heat, basically if people in Texas, say, didn’t feel that the intense heat wave and drought of last summer, if they didn’t feel that was a wakeup call, then they’re really not paying attention. What we’re talking about with climate change is moving into a period of time when that kind of heat wave, that kind of drought, becomes normal, and additional heat waves and additional droughts are superimposed on it. The drought in Texas and Oklahoma last summer was unprecedentedly severe. Climate scientists are now saying that drought, because it doesn’t have in its intensity, clear precedents in recent centuries, that drought was by all indications caused by anthropogenic climate change. So if you don’t mind living under those conditions, and watching what those conditions do to the landscape around you, climate change shouldn’t be scary for you, but if you didn’t like it that way, you should be concerned. The Texas Department of Forestry estimates that between 2% and 10% of all the trees in Texas died last summer. The range is pretty wide because the count is imprecise, but if dry conditions persist through this year, the cumulative effect of the drought will probably lead to an even greater die-off. So this is a very large portion of the ecosystem of the State of Texas that died off in one year. “(LL) So what should be our take-away message if we want to react positively to this serious situation? That’s the end of the transcript. Five minutes is so short, at least two questions remain to be explained. First, what has the carbon tax and the carbon-based economy got to do with climate change? If you want to understand why carbon is important, you will need to understand some basic biology that you might find in previous editions of Bare Bones Biology. You can read them by flipping back on this blog, or listen to them at http://www.BareBonesBiology.com. The climate change series begins with Bare Bones Biology 093 and ends at Bare Bones Biology 100. Or for a small donation to cover costs I will send you a CD containing both the podcasts and the blog posts for each of these BBBs. If you don’t want to do that, here’s the shortest possible version of the carbon message to all of life on earth. We can’t live without energy, because energy is the ability to do work. Work is basically anything that moves, and without that, of course, there would be no life and no us. On this earth, all of our energy for food and everything else that living things use to stay alive comes from burning organic molecules such as proteins, carbohydrates, and all those organic molecules found in foods. Organic molecules are made on a base of carbon atoms. The plants make them using energy from the sun, we can’t do this, so we eat plants to get the energy for life. The energy for life on earth comes from eating plants. Or something else that ate plants. Then we burn (metabolize) the organic molecules, and the organic molecules release their metabolic energy in a form our bodies can use — and so we stay alive. When we burn anything (including in our metabolism) the organic molecules are taken apart, the energy is released, and the carbon (and other atoms) are released as waste products of the burning process. The whole earth ecosystem is a living thing, and to stay alive it needs to stay balanced. So it recycles the waste products (carbon dioxide in this case) by using them as ingredients to make more carbon-based organic molecules. The plants can do this, we cannot. Life has been doing this for millenia – life is based on this cycle staying in balance – but today we have unbalanced the life of the whole earth by burning more organic molecules than it can recycle. The living earth is trying to rebalance, but we are also reducing the plants it needs to do this, so the earth is unbalanced. There is too much carbon dioxide in the air (and other places). Everything in the ecosystem is connected, so this imbalance has some effect on the other processes of life. In this case the effect is to raise the temperature by changing the interaction between the sun and our earth atmosphere. The result is that the more people are breathing out carbon dioxide and the more machines also are breathing out more carbon dioxide as a waste product of burning carbon-based fuel – the harder the living earth must work to try to stay in balance. Now, after all these centuries – it has come to the time that it can’t keep up. That’s the basic link between climate change and carbon compounds. As is true of everything it is a lot more complicated than that, but I do think it’s important to understand that there is an unchangeable, life-giving link, so we don’t fall for corposystem propaganda to the contrary. Check my facts – please. The second question is about people who do NOT care what the climate change does to the environment because they live in cities and they honestly believe that the corposystem is providing everything they need to stay cool, well fed and clothed. This is just too sad to be real, but I think it is real. These people do not know that everything we need to stay alive comes from the healthy ecosystem. The corposystem cannot make earth, air, water or food for us without destroying the energy cycle of the ecosystem. The miracle behind life on earth is that it CAN do this process. People cannot. Not without using more energy than they generate and throwing us more out of balance. And there is no other source for life in the whole universe so far as we know. If God made this beautiful living earth ecosystem, then he made it here. Not on the moon or Mars or anyplace else that we can reach. And he expected us to fulfill our responsibilities to not trash His Creation. But we are trashing it, and so the outlook does look very grim. Here’s what Wm deBuys has to say about that. Please read the book. It’s a good read and interesting, and it helps to answer the most common questions about what we can do to help ourselves and the living earth. The most important thing that we can do is to learn more about how the ecosystem functions to stay alive — including all the interacting stories that make up “A Great Aridness” — so we can discuss solutions that make good sense, and so that we will not be fooled by self-serving money-making schemers, who always abound in every crisis.